Priced at $49.99 USD you’re getting a pretty great deal with the Pulsefire FPS. If you’re using a computer, you’re probably going to need a mouse or some other input device. 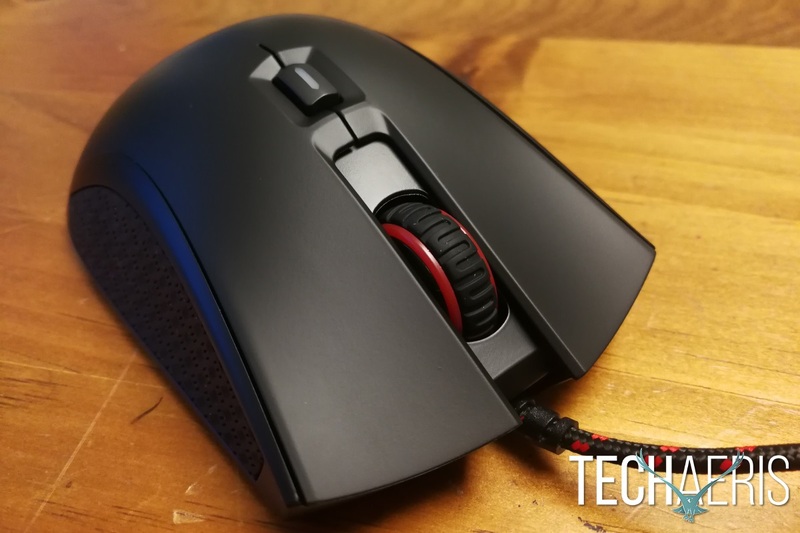 If you use your computer for gaming, you’re going to want a mouse built to provide a solid gaming experience. HyperX has recently expanded their gaming hardware lineup to include the HyperX Pulsefire FPS gaming mouse. 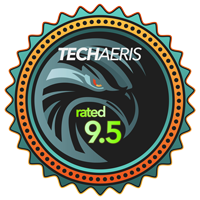 Keep reading to see how it performs in this full review. These are the things you’ll find in the box. 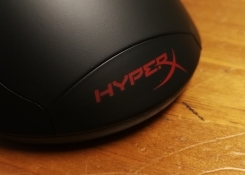 Starting at the back, you’ll see the HyperX logo, which lights up red when the mouse is powered on. The body of the mouse tapers in the middle before spreading out a bit towards the front. 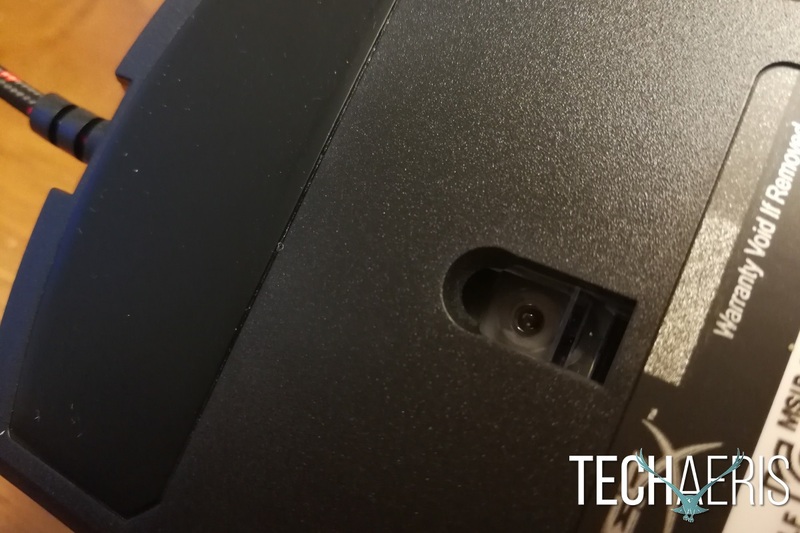 The mouse buttons have a nice angled shape along with slight grooves for your fingers. Between the mouse buttons is the standard scroll wheel, which also lights up red. Just behind the scroll wheel is the DPI settings button which adjusts between the four available DPI settings. 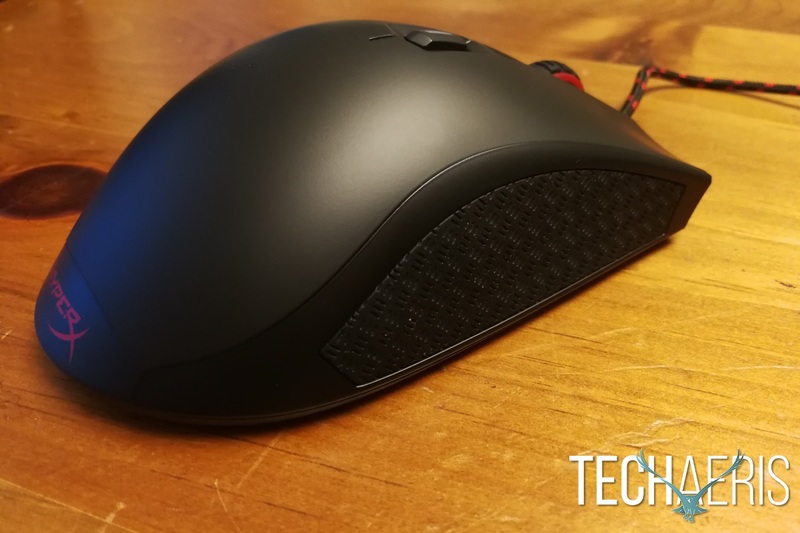 The right side of the mouse has a nice rubberized grip that keep your ring and pinky fingers held nicely. The left side features the same rubberized grip along with two additional thumb buttons just above where your thumb naturally rests. The bottom of the mouse has two very large mouse skates that keep the mouse sliding nicely over most surfaces. In the middle you’ll see the Pixart 3310 sensor that controls your mouse movement. The 3310 isn’t the newest of the Pixart sensors, but from everything I’ve read there’s no discernable difference between the 3310 and the newer models. I definitely didn’t experience any problems and had nothing but great performance, as I’ll discuss in later sections. Overall this is a very nicely designed mouse. It fits comfortably even in larger hands, and has a very nice weight to it. I never felt that it was too light or too heavy even during longer gaming sessions. Plug & play, it really doesn’t get a whole lot easier than that. Simply plug the Pulsefire FPS into an available USB port on your computer and you’ll be ready to rock and roll. There’s no software to install, so you’re ready to get started immediately. You can, however, assign the additional buttons inside of your apps or games that support key binding. It may be nice at some point if HyperX offered some sort of app as their gaming hardware line is definitely expanding. 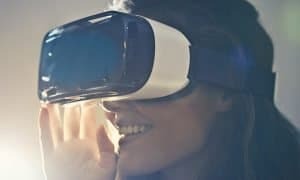 While no software is a plus for some, having a consolidated space to control your various gaming hardware is also a plus if you’ve got multiple pieces of hardware from the same company. Left side, with additional thumb buttons. The top button cycles through the DPI settings, with each level represented by a different color — white (400DPI), red (800DPI), blue (1600DPI), and yellow (3200DPI). As usual, I was pretty comfortable with one of the lower DPI settings, but there are plenty of options for everyone to find something they’re comfortable with. 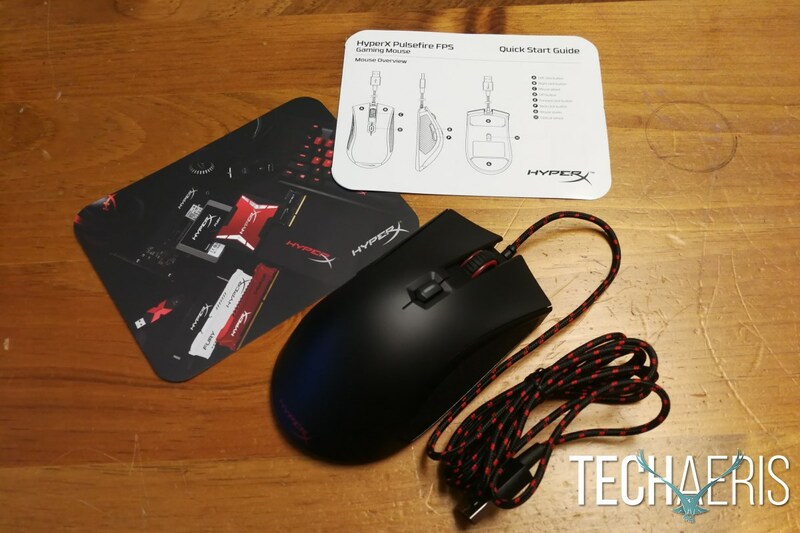 HyperX was nice enough to include one of their desktop mouse… mats… along with the Pulsefire FPS gaming mouse. The mouse pads come in four sizes from the relatively standard mouse pad all the way up to the desktop mat that I received. At approximately 16″ x 35″ the XL mat is big enough to cover a large portion of your desk, acting as a mouse pad as well as providing a resting place for your keyboard. I’d definitely recommend picking one up, as it prevents any possible shifting that you might otherwise find with a regular mouse pad. 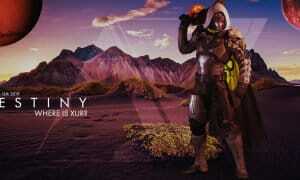 The XL Fury S Mouse Pad is only $29.99 USD, with smaller sizes priced from $9.99 – $19.99 USD. 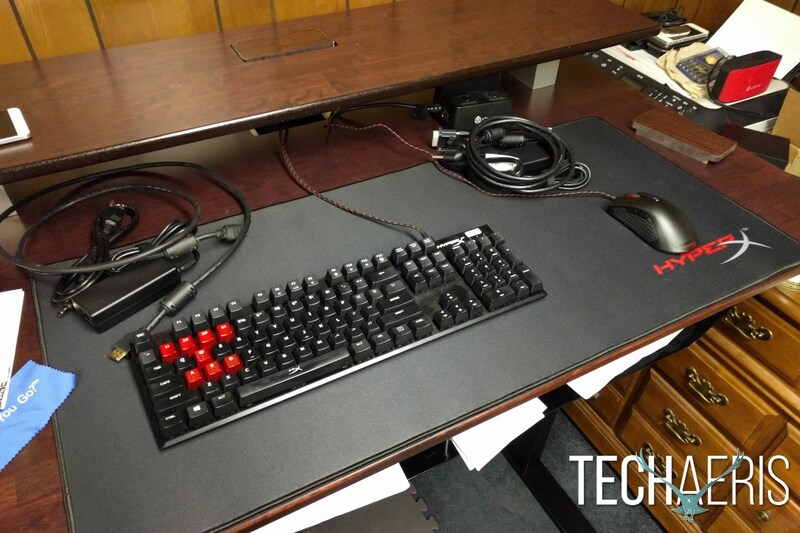 The XL Fury S Mouse Pad will cover a large portion of most any desk. The mouse itself performs admirably as well. I’ve got big hands and the design is very comfortable to hold for me, though it’s definitely going to work best in a palm grip. The two standard mouse buttons have a very good response with Omron switches. All of my clicks reacted as anticipated, and motion/scrolling were both incredibly smooth as well. The additional thumb buttons are far enough out of the way that you’re not likely to strike them accidentally. They’re not so far that they’re horribly difficult to reach, but the front thumb button was maybe just a touch farther than I was really expecting it to be. That may cause some problems for those with smaller hands. The mouse is very light, but it is easy to control, and I didn’t feel that it needed any additional weight. Large sliders keep the Pulsefire FPS moving smoothly. Mouse movement and action was spot on, and I had no issues in any of the games that I played. Games like Overwatch, where twitch reactions and accurate aiming are important worked very well, which makes sense considering FPS is in the name of the mouse and everything. 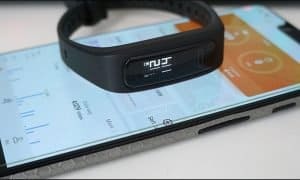 Even just for regular web browsing and other mundane computer activities, I had no problem with the performance and action of the Pulsefire FPS. Priced at $49.99 USD you’re getting a pretty great deal with the Pulsefire FPS. For the price you’re getting a solid gaming mouse that’s very comfortable in your hand. There’s no software to install, which is a definite plus for some, and the performance is spot-on thanks to the Pixart 3310 sensor and Omron switches. Right side, with rubberized grip. 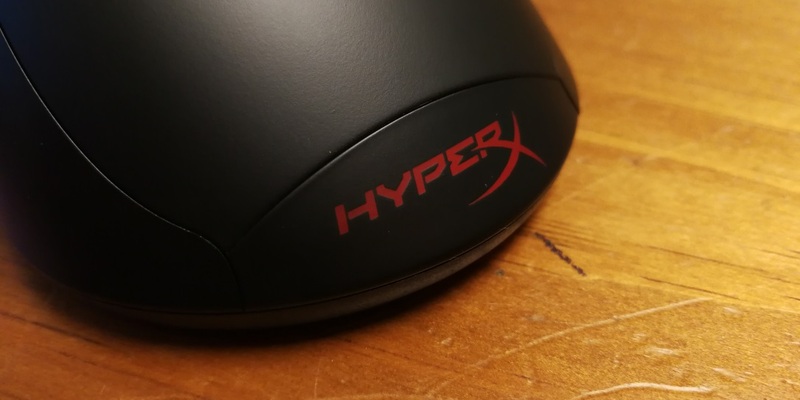 If you’re looking for a solid gaming mouse, the HyperX Pulsefire FPS deserves your attention. It’s solidly built, very comfortable to hold, has a great sensor, and it’s completely plug and play. 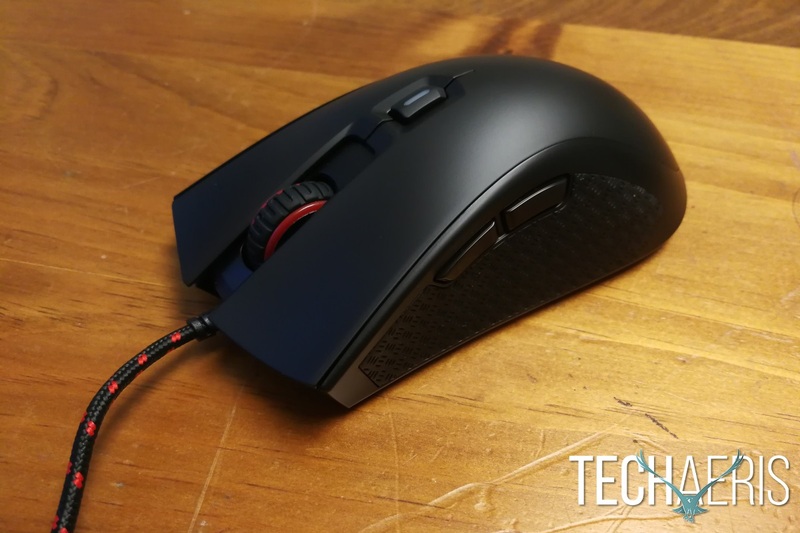 *We were sent a review sample of the HyperX Pulsefire FPS for the purposes of this review.